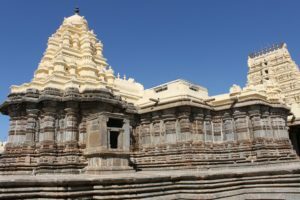 Introduction – Rattihalli is now reduced to a small village however in medieval times it was the capital of a division of the Banavasi country. The division was known as Rattipalli Nurumbada (Rattihalli-100) comprising of 100 villages with Rattihalli as their main town or capital. It is located on the bank of Kumadvati river which is an offshoot of Tungabhadra river. Bombay Gazetteer tells that in 1881, population of the town was 2332. The population has been grown to 11,702 as per 2011 census. In inscriptions, Rattihalli town is said to be the crest jewel of Rattihalli division (Rattihalli Nurumbada) of Banavasi-desha. With its shining temples beautiful by their limewash, it was compared with the city of Shiva. An inscription describes that Rattipalli was seen by onlookers such that it was exceedingly shining, served with a host of pleasure gardens and residences of gods, with numerous, foremost brahmans, with rows of pleasing, incomparable mansions. First reference of Rattihalli is found in an inscription of the time of the Western Chalukya king Jagadhekamalla II (1138-1151 CE). It is told that Rattihalli-70 and Itgi-30 divisions were united to constitute Rattihalli Nurumbada or Rattihalli-100 comprising of 100 villages. In which king’s regime this was done is not mentioned, however it may be surmised that it could be the Western Chalukya king Somesvara I or Somesvara II. This Nurumbada was given to the Kadamba chief Biradeva when he defeated the enemies of the Chalukyas and presented a tusker to the king as a war trophy. Since then the Kadambas governed over Rattihalli Nurumbada under the patronage of the Western Chalukyas. Kadambas continued to rule under the Kalachuris but with the advent of Yadavas (Suenas), their rule ended. Inscriptions of the Yadava king Singhana II are found in the town. During his reign, the Kadambeshvara temple complex was enlarged with two additional cells. During the power shuffle between the Yadavas and Hoysalas, Rattihalli would have witnessed the change of guard now and then. However whether there was any Hoysala influence on the town is not very clear as no inscription of theirs was found here. Ultimately it passed over to the Vijayanagara kingdom. Rattihalli witnessed a bloody contest between the Peshwas and Hyder Ali in 1764. Madhavrao I succeeded his father Balaji Baji Rao as Peshwa in 1761. He was an able and energetic ruler. Madhavrao made extensive preparations to counter Hyder and get back his territories. Hyder Ali was aware that after he had ousted the Marathas from Sira district, this would incur resentment of the Peshwas. Therefore he availed himself of the aid of Raza Ali Khan, who had served with French, to train and discipline his troops. Hyder Ali, under his general Fazl Ullah, took a strong position at Rattihalli with 20,000 horse and 40,000 foot soldiers. Madhavrao gaining through his cavalry correct information of the strength of Hyder’s position determined not to attack it and instead deployed his troops in driving out Hyder’s garrison from the towns and villages north of Varada river. Hyder was defeated and had to flee the battle field to the woods of Bednur country. Madhavrao extensively pursued Hyder and the latter had to send his family to Srirangapatna. Hyder was hemmed at all sides and sued for peace on condition that he had to leave all territories formerly held by Morari Rao of Gutti and Savanur should be surrendered and additionally thirty-two lakhs rupees should be paid as an indemnity towards Maratha expenses incurred on this war. Monuments – Apart from few modern temples, Kadambeshvara temple is the temple of most interest. Kadambeshvara Temple – Kadambeshvara was the tutelary deity of the Kadambas of Rattihalli. There is no inscription describing the foundation of the temple, the first reference of it came during the time of the Western Chalukya king Jagadhekamalla II (1138-1151 CE), which suggests that the temple was in existence by his time. This is a trikuta (triple-celled) complex, however it was not originally a trikuta shrine. Originally only one cell for God Kadambeshvara existed, but in 1237 CE (inscription 3 of the article) two more cells were added to the complex by a minister of Yadava king Singhana II. He installed god Malleshvara and god Rajeshvara. Their directions whether north or south is not mentioned in the inscription. Vasundhara Filliozat tells that it is not hard to find which direction belongs to which god. Vasundhara tells that temple manifest the Sadashiva aspect of Shiva. Sadashiva is manifested with five faces, four faces shown and one generally hidden. In this temple, three different aspects are represented by three different lings in three different directions. The southern linga should be Malleshvara (malla = warrior) as it should represent the Aghora aspect of Sadashiva. The northern linga would be Rajeshvara should represent the Vamadeva (Umavaktra or Uma’s face) aspect of Sadashiva as it was dedicated to mother of the minister. The antarala (ante-chamber) doorway of the west cell has an exquisite makara-torana above the lintel. Shiva as Natesha is shown in the center of it. Vasundhara identifies the dancing posture as of Shaivasthana. On his left are shown Brahma and Ganesha. On his right are shown Vishnu and Mahishasuramardini. On either extreme sides of torana are shown sankha-nidhis. Such toranas are absent on northern and southern ante-chamber doorways. Few stray icons are placed inside around the latamandapa. There are two Shivalingas, in front of south and north niches of the west wall. South niche houses Ganesha while the north niche houses Saraswati. Ganesha is in his usual position however arrangement of Saraswati is not proper therefore it can be assumed that this image has been transported from some other site or place. A broken Saptamatrika frieze is in the niche of south wall of rangamandapa. A Nagi and a Chamunda images are also placed around the mandapa. All the three cells are connected to a latamandapa. Latamandapa has a central platform supported on four pillars. On this platform, a huge Nandi is placed, looking in the direction of the west cell. This Nandi does not seem to be in its original position as it is not in the center but on a different axis to the main west cell. The pillars are decorated with sixteen side frieze on which many miniature carvings are found. This latamandapa is connected in the east to a large ragamandapa which can be called a maharangamandapa owing to its size. This maharangamandapa is open on sides and supported on pillars. Two dvarpalas are placed at the doorway connecting latamandapa. Vasundhara tells that Shiva has two dvarapalas, Nandi and Mahakala. The northern dvarapala represents Nandi while the southern one represents Mahakala. Canine teeth on the southern dvarapala supports this hypothesis. The north tower of the temple has not survived, the other two have three floors each. The west tower shows three different aspects to Shiva, the south side shows Aghora, the west shows Sadyojata and north side Vamadeva (Umavaktra) aspect. The south tower is mostly dedicated to the Bhiarava images thus signifying aghora aspect of Sadashiva. On the sukanasi of the west tower, there is a well familiar emblem of a man slaying a lion. This emblem is mostly seen in Hoysala temples, and this made Henry Cousens to put this temple also under the Hoysala temple category. However this temple has no association with the Hoysalas. This emblem and many other similar emblems were employed by various other dynasties apart from the Hoysalas. This temple shows Western Chalukya characters and should not be misinterpreted as Hoysala. Vasundhara Filliozat also thinks on the same lines. The temple was under the priesthood of the Kalamukha pontiffs. Murujavideva, the priest who was the pontiff during the Yadava period and who was responsible for converting the single cell temple into trikuta structure had his spiritual lineage from the Kittagavi santati of Parvatavalli (modern Srisailam). Kalyanashakti of Haranhalli was one of his spiritual predecessor. Inscriptions – There are 10 inscriptions in total as per Dharwad Gazetteer. On a stone slab kept on south-east corner of the compound – Kalamukha Temples of Karnataka – language Kannada with few Sanskrit verses – not dated, dated to 1144 CE on the basis of the reigning king Jagadekamalla II- The record starts with genealogy of the Western Chalukya kings starting with Tailapa. His sons were Satyasraya, Vikrama, Ayyana and Jayasimha. Jayasimha’s son was Trailokyamalla and his sons were Ahavamalla Somesvara & Permadi. Somesvara’s son was Jagadekamalla who was ruling at that time from his capital Kalyana. His home-minister was Bammadeva. Jagadekamalla gave Banavasi to be ruled by Bammadeva. After him, his brother Madhava governed the region. Nurumbada flourished as a province in Banavasi after uniting Ittige-30 and Rattihalli-70 becoming Rattihalli Nurumbada. Then comes the genealogy of Rattihalli Kadamba chiefs starting from Biradeva. Biradeva got Rattihalli Nurumbada when he won a battle and presented a tusker to the king. His younger brother was Keta, his son was Nama, his son was Ketarasa (II), his sons were Polikesi and Perma (Ranakideva). Ketarasa (II) with his wife Attimabbe begot three more sons, Biradeva, Bammarasa and Malla. Biradeva married to Bacaladevi, a princess from Gutta family of Guttavolal (present Guttal). To them was born Ketarasa (III). He married Kancaladevi, Laliyadevi from Gutta family and Doraladevi from Sinda family. King Ketarasa (III) is said to be the worshipper of God Kadambeshvara while governing Rattihalli Nurumbada. Then came description of minister Soma. Stele installed in the temple premises, in the rangamandapa, on the south wall – Kalamukha Temples of Karnataka – It refers to the rule of the Kalachuri king Rayamurari Sovideva – dated Saka 1097, corresponding 1174 CE – salutation is given to Shiva, Vishnu and Kadambesha. Chalukyas were said to be ruling over Kuntala region. But a branch came off with Bijjala and queen Indira. Their son was Somabhupa. Banavasidesha is said to be protected by king Rayamurari Sovideva. River Kumudvati is said to be encircling the town of Rattihalli. Then comes genealogy of Rattihalli Kadamba chiefs starting from Biradeva. Biradeva got Rattihalli Nurumbada when he won a battle and presented a tusker to the king. His younger brother was Keta, his son was Nama, his son was Ketarasa (II), his sons were Polikesi and Perma (Ranakideva). Ketarasa (II) with his wife Attimabbe begot three more sons, Biradeva, Bammarasa and Malla. Biradeva married to Bacaladevi, a princess from Gutta family of Guttavolal (present Guttal). To them was born Ketarasa (III). He married Kancaladevi, Laliyadevi from Gutta family and Doraladevi from Sinda family. Ketarasa (III) and Laliyadevi begot Pandya. King Pandya is compared with Garuda. Pandya was married to Bacaladevi, daughter of king Vikramaditya. Mahamandaleshvara Pandya is said to be worshiping the feet of God Kadambeshvara. Hadavala Siriyanna was worshipping the lotus feet of king Pandya. He with his wife Cagavve begot Caunda. He is said to be the Garuda of the king Pandya. Then comes the appreciation for the temple priest Guru Kalyanashakti. He is said to be maintainer of the Kalamukhs system and belonged to Kittagavi school. Lineage of Kalyanashakti is given. Once there was an ascetic Vamadeva, his disciple was Vadirudra, his disciple was Kriyashakti, his disciple was Amrtarasi, his disciple was Srikanthadeva, his disciple was Kriyashakti and his disciple was Sarveshvara. Kalyanashakti was the disciple of Sarveshvara. In this lineage was born Murujavideva. His disciple was Lakulishvara. Thus washing the feet of Kalyanashakti, some land was granted to God Kadambeshvara for repairs. Slab in the inner mandapa of the temple – Kalamukha Temples of Karnataka – dated saka 1160, corresponding to 1237 CE – record belongs to the reign of the Yadava king Singhana (II). His genealogy is provided from Bhillama (V), his son Jaitugi and his son Singhana. Singhana’s minister was Honnabamma. Son of Honnabamma, Arya Malla, was the general of the king Singhana and he won over the southern regions for him including Dorasamudra. Arya Malla had three sons, Ariya Reva, Honnabamma and Caunda. Honnabomma with his wife Kamaladevi begot Guptamalla who was ruling from his capital at Mulugunda. Honnabamma is said to have burnt the forts of Kodamoghe, Koppala and Dorasamudra. Honnabamma was a believer in jangama and devoted to its worship. Lineage of the Rattihalli Kadambas is provided from Biradeva who presented a tusker to the then king and obtained Nurumbada. His younger brother was Ketarasa (I), his son was Somarasa, his son was Ketabhupa (II). Ketabhupa (II) had five sons, Polikesi, Hemma, Biradeva, Bamma and Malla. Biradeva got Keta (III) who in turn got Vira Pandya and Garuda Pandya. Then is described the Kittgavi santati of the Kalamukha doctrine. Their lineage is described from Vamashakti to Vadirudra to Srikanthadeva to Kriyashaktideva to Kalyanashakti to Murujavideva to Lakulishvara to Murujavi. Honnabamma installed God Malleshvara and Rajeshvara in the premises of Kadambeshvara. The Kadambeshvara temple is told to the plinth for the mansion of Kadamba’s royal fortune. He also donated a land to the temple which was lost by queen Bacaladevi after she lost the royal power. On a pillar in the maharangamandapa of the temple – Kalamukha Temples of Karnataka – dated saka 1161, corresponding 1238 CE – The inscription refers to the Yadava king, enemy of the Kadambas, king Singhana (II) and his minister Ariya Malla. Honnabamma, Cauda and Acallya were born to Malla and his wife Rajave. Karanada Kalla is said to be the minister of Honnabamma. Gubbiya Kalla was the husband of Honnabamma’s sister. When Gubbiya Kalla was in-charge of tolls, at an auspicious occasion made a grant to Murujavideva for the purpose of perpetual lamp at Kadambeshvara temple. On the same pillar as no 4 on lower compartment – Kalamukha Temples of Karnataka – not dated, dated to 1239 CE on astronomical grounds – This seems to be in continuation of the above inscription, however engraved at a later date. The great minister Karnada Kallarasa granted various lands to god Mallinatha and Kalladeva. Various other grants are also mentioned. A hero-stone on the back wall of a shrine on Kumudvati river – not dated, it could be either 1290 or 1299 of the reign of the Yadava king Ramachandra – The record refers to the reign of the Yadava king Ramachandra. His home minister was Saluveya is said to be the chastiser of the Hoysalas. Gandabherunda of Huli, Hariyapaya was the home minister of the Hoysala king Ballala (III). When Hariyapayya attacked Rattihalli, Sroimatu Pingudinayaka came to protect the town. Keeping his army at his back, he fought with the Hoysala army. Hero-stone in front of a temple belonging to Madhva community – Kalamukha Temples of Karnataka – not dated, but should be of 13th century CE – it mentions a grant to the children of a certain Makara Pandya who died while fighting with bandits who attacked Murujavideva who was on his way to Huligere (modern Lakshmeshwar). How to Reach – Rattihalli is located on state highway 57 and is about 16 km from Ranebennur and 26 km from Hirekerur. Harihar is the nearest railway head which is about 42 km far. Rattihalli is a small village so very moderate accommodation and lodging options are there. Filliozat, Vasundhara (2012). Kalamukha Temples of Karnataka. Indira Gandhi National Center for the Arts. New Delhi. ISBN 978812460605.